After a major storm flooded towns in the Bay Area a popular market in Sebastopol is grappling with damages. Merchants say there could have been more done to prevent damages. Jodi Hernandez reports. 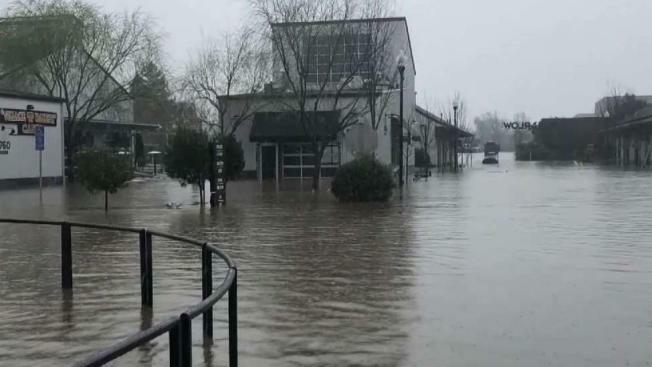 After a major storm flooded parts of the Bay Area, merchants at a popular Sebastopol market said there could have been more done to prevent damages. Merchants at The Barlow said the city had approved a flood plan for the area that was not carried out properly by the shopping center’s management. Among the issues, accusations that steel barriers meant to keep water out, were not deployed as they should have been. "There was a plan but you can only go so far with what’s on paper, you need to deploy a plan with time and resources," café owner Kendra Kolling said. Merchants said they poured their entire life savings into opening these shops and restaurants and now, many vendors don't know how they’ll recover. "All of my equipment was 5 feet in water, it was floating," said ice cream shop owner Jacki Wilson. "My humongous fridge was on its side floating in the water, everything was under water."